Gov. Rick Perry leads Bill White 39 percent to 33 percent in the latest University of Texas/Texas Tribune poll, whose most interesting finding is a restless electorate dissatisfied with conventional choices up and down the ballot. In the governor's race, 22 percent of respondents said they were undecided about which candidate to support with only seven weeks to go in the fall campaign. Third-party candidates are capturing enough of the vote to affect the outcomes of some statewide contests. And 31 percent of respondents — nearly one in three Texans — consider themselves part of the Tea Party movement. 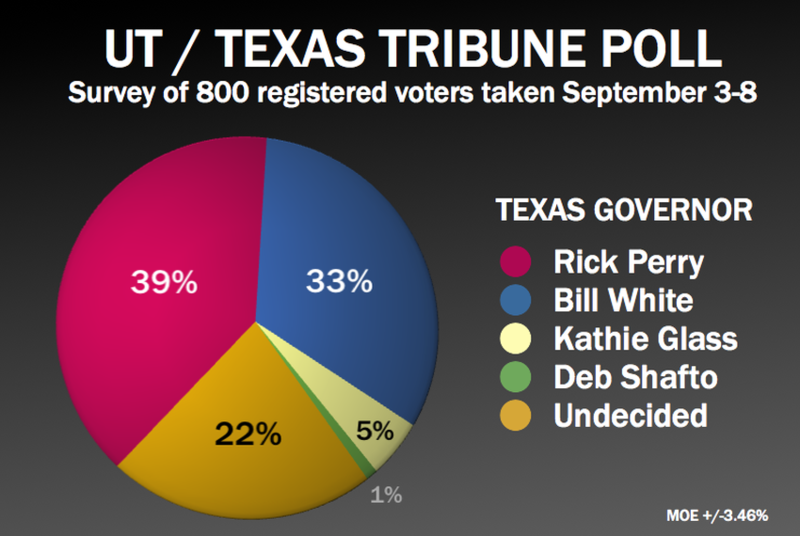 Results of the September 2010 University of Texas/Texas Tribune poll in the general election for governor. “White has not yet faded and remains in striking distance of Perry,” says Daron Shaw, a government professor at the University of Texas who oversees the UT/Tribune poll with his colleague Jim Henson. “The downside for White is that Perry is up by 18 points among those who say they are extremely likely to vote. White needs a big turnout among young voters and minorities to be competitive." "There are a lot of people out there who are not ready to respond to a poll about who they're going to vote for," Henson says. "If you look at the breakdown, there are a lot of moderates and a lot of independents." In other statewide races, Texas voters consistently favor Republican incumbents over their Democratic challengers. The widest margin — 17 percentage points — is in the race for attorney general; the narrowest — 7 percentage points — is in the contest for agriculture commissioner. • Lt. Gov. David Dewhurst is leading Linda Chavez-Thompson 41 percent to 26 percent. Libertarian Scott Jameson has the support of 5 percent, and the Green Party's Herb Gonzales Jr. has 1 percent. Undecided respondents account for 27 percent. • Attorney General Greg Abbott is leading Democrat Barbara Ann Radnofsky 43 percent to 26 percent, with Libertarian Jon Roland pulling 5 percent. Undecided voters represent 26 percent of the total. • Land Commissioner Jerry Patterson leads Democrat Hector Uribe 35 percent to 25 percent. Libertarian James Holdar is at 7 percent, while 34 percent are undecided. • Agriculture Commissioner Todd Staples leads Hank Gilbert 33 percent to 26 percent. Libertarian Rick Donaldson has 8 percent, while 33 percent are undecided. • In the only open seat on the statewide ballot, Republican David Porter leads Democrat Jeff Weems 33 percent to 25 percent, with Libertarian Roger Gary the favorite of 6 percent and Art Browning of the Green Party attracting 2 percent. Undecided voters make up 34 percent of the total. The comptroller's race, in which no Democrat filed against incumbent Republican Susan Combs, wasn't included in the poll. She'll face Libertarian Mary Ruwart in November. The high numbers for the Tea Party suggest dissatisfaction with the status quo, and those voters are overwhelmingly from the GOP ranks. But that doesn't appear to be helping the Democrats. Of the respondents who self-identified at Tea Partiers, 70 percent favor Perry, 10 percent favor Glass, 7 percent favor White and 14 percent are undecided. Asked what candidates they would support with the Tea Party included on the ballot, 33 percent chose Democrats, 20 percent chose Republicans and 18 percent chose Tea. Combine Republican and Tea leanings and the number is similar to Perry's support in a head-to-head with White; the Democrat number matches White's head-to-head support. Another sign of electoral disquiet: Even with the Tea Party included as an alternative, 30 percent of registered voters don't align themselves with it or either of the major parties. On generic questions about how they'll vote in the coming election — preferences based on party rather than on candidates — Republicans have a clear advantage over Democrats. Almost half say they would chose a Republican (48 percent) over a Democrat (33 percent) in a congressional election held right now. Five percent answer "neither," and 14 percent have no opinion. The numbers are about the same with "Texas state Legislature" substituted for "U.S. Congress": 47 percent Republican, 32 percent Democrat, 6 percent "neither," 14 percent "don't know." About as many people approve of Perry's job performance as disapprove, although those who feel strongly about him are more negative than positive: 40 percent approve strongly or somewhat, while 42 percent disapprove strongly or somewhat; 12 percent strongly approve of Perry's performance, while 25 percent strongly disapprove. Only 3 percent register no opinion. The poll didn't ask about White's job performance since he's not currently in public office. But voters were asked to register their feelings about the gubernatorial nominees using a 100-point scale, with "0" for "extremely unfavorable and cold" to "100" for "extremely favorable and warm." Their take? Virtually no difference: Perry gets a mean score of 49 percent, and White gets a mean score of 50 percent. In the marquee matchup, White outdoes Perry in urban areas (41-31) but trails him in the suburbs (32-40) and in rural Texas (28-45). Surprisingly, the two are virtually tied in the Houston area (36-35), which was expected to be a stronghold for White, the former Houston mayor. The other metros in the state — D/FW (40-34), San Antonio (42-39) and Austin (46-27) — favor White over Perry by varying degrees. In the rest of the state, Perry has a daunting 47-21 lead over his challenger. Self-identified Anglo voters favor Perry by a 47-27 margin; African-American voters overwhelmingly favor White, 64-7; and Hispanic/Latino voters give White a slim 34-30 edge. Women are equally divided, giving each candidate 34 percent. Men prefer Perry, 44-33. Men are more likely than women to pick the Libertarian candidate; 7 percent of men do versus 3 percent of women. And more men have made up their minds: Fifteen percent of men are undecided, while 29 percent of women say they haven't yet chosen a candidate. This is the fourth University of Texas/Texas Tribune poll (the others are here, here and here). The survey of 800 registered voters was taken September 3-8 and has a margin of error of +/- 3.46 percent.